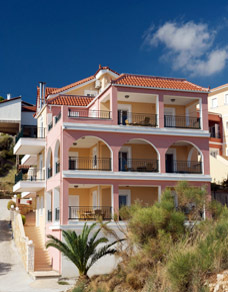 Mari – Christi Apartments are built by the sea of Poros Kefalonia. Every visitor is charmed by the unique sea view of the balconies. Enjoy your vacation in Mari Christi apartments with excellent service and reasonable prices, just a kilometer far from the port and the centre of the village. There are 6 luxurious apartments that can guest 4 – 6 visitors, fully equipped, spacious (60m2) and modern decoration. Enjoy carefree holidays in our apartments in serenity, relax by gazing the sunrise while having breakfast and feel the fresh breeze.